With what passes for winter actually wintering this year in Santa Barbara (rain! temps in the low 30s! 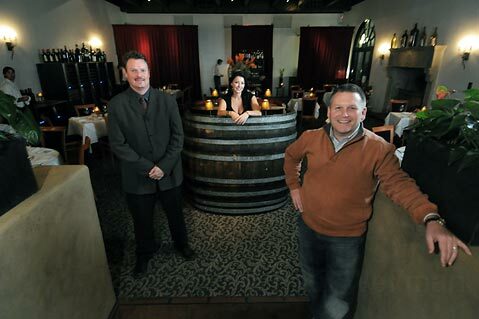 ), it’s good to know one of the best spots with a fireplace is finally reopened, Wine Cask Bar/Cafe. The change in the name from the more middle-browish Intermezzo is a hint as to what owners Doug Margerum and Mitchell Sjerven are up to: This is a spot to nosh well and hang out over fine cocktails (the Ginger Julep is a particularly delightful potable to fight off winter ague). Chef David Sundeen has come up with a beguiling short list of cafe-inspired food, from flatbread pizzas with lots of pizzazz, such as prosciutto, Humboldt Fog, oven-dried tomato, and arugula, to salads that are truly dinner-worthy, like a Nic§oise with what has to be sashimi-grade ahi seared on the top plus a terrific, biting dressing. And then there’s fritto misto that goes beyond the now cliche calamari with anchovies (they taste like the good white ones so in vogue) and thin lemon slices, all crisply fried. On the side there’s a gribiche, a wonderful saucy surprise with its boiled egg adding creaminess to the dish. Then you can also end with the butterscotch pudding that’s on the main restaurant’s dessert list, too, and you really should-it’s thick-licious.